Considering the fact that Vanessa Marcil has been in the acting world for over two decades, it is no surprise that she is one of the celebrated stars in the movie industry. She started out with a role in the television drama series, General Hospital and has branched out into diverse other roles including in lengthy movies and short films. She has had her own share of defeat when it comes to love but has a son she would die for. Read on to find out more about her. Vanessa Marcil is an American actress noted for her role as Brenda Barrett Corinthos in the ABC soap opera, General Hospital (GH). She opted out of the show in 2011 but returned as a guest actress in 2013. She has gone ahead to feature in a few other movies and television series. The actress was born on October 15, 1968, in Indio, California as Sally Vanessa Oritz and she is the youngest of four children belonging to herbalist Patricia Marcil Ortiz and contractor, Peter Ortiz. Sally was raised alongside her other siblings, Tina, Sherry, and Sam in Palm Desert. She is of mixed ethnicity – French, Italian, Portuguese and Mexican. The actress was a student at Indio High School and was one of the stars in the school’s theater group; Indio’s Circle Theatre Acting Company. Upon graduation, She went ahead to study law at the College Of the Desert, Palm Desert, California. Her interest in acting spurred up when she was 8 and she took to school plays and also starred in most of the talents shows organized in her time. In fact, she emerged as a winner in one of those numerous shows precisely in 6th grade while performing her own song. After excelling in a few roles on theatre production, she took the offer to play as Brenda Barret on the drama series General Hospital (GH) in 1992. She became a recurring star on the show and played effectively for six years before opting out in 2011, however, she later graced the platform again in 2013 as a guest actress. In between the period she left GH, she took up other television roles including To Love, Honor, and Deceive (1996) and High Incident (1997). Meanwhile, during her stay in GH, Marcil wasn’t totally limited to the show. She engaged in other television roles and also made her debut film appearance in the movie, The Rock; a 1996 movie. In 1998, the actress appeared as one of the casts for the drama series Beverly Hills. For her performances on GH, she was nominated twice for the Emmy Award for Outstanding Supporting Actress bagging the award in 2013. After receiving the award, Vanessa Marcil opted out of the drama series again and took up a role in the thrilling NBC drama series, Las Vegas. She reprised the role for 5 seasons before leaving in 2008. Later on, she appeared on a related show, Crossing Jordan. Subsequently, the actress played as a host on the reality game show, Blush: The Search for America’s Greatest Makeup Artist and also took up roles in NBC’s Lipstick Jungle appearing in just three episodes. In 2009, Vanessa took to acting lengthy movies and appeared in the Hallmark channel movie, The Nanny Express and in One Hot Summer. In 2010, she showed her acting prowess in the web series; The Bannen Way before returning to General Hospital. The show which celebrated its 50th anniversary in April 2013 had Marcil attend as a guest. Following the next years, she starred in a few other movies including, Paradise (2014), Queens of Drama (2015), The Convenient Groom (2016) to mention a few. When it comes to love, Vanessa has had her share of heartbreaks as she has been married and divorced twice. She was first married to actor, Corey Feldman in 1989. Their union was later dissolved in 1993 with no kids. Her second marriage was to Carmine Giovinazzo, the two exchanged their vows on July 11, 2010, but sadly, like her first, her union with him also hit the rocks. Meanwhile, Vanessa Marcil had an affair with her co-actor on the drama series; Beverly Hills, Brian Austin. The two seems to have it all jolly and also welcomed a son named Kassius Lijah, born on 30th March 2002. Apart from her acting endeavors, Vanessa Marcil moved into business and currently owns a clothing label known as Kass. Part of the income made from the clothing lines are used in building schools for kids in Africa and is also used to help African mothers. 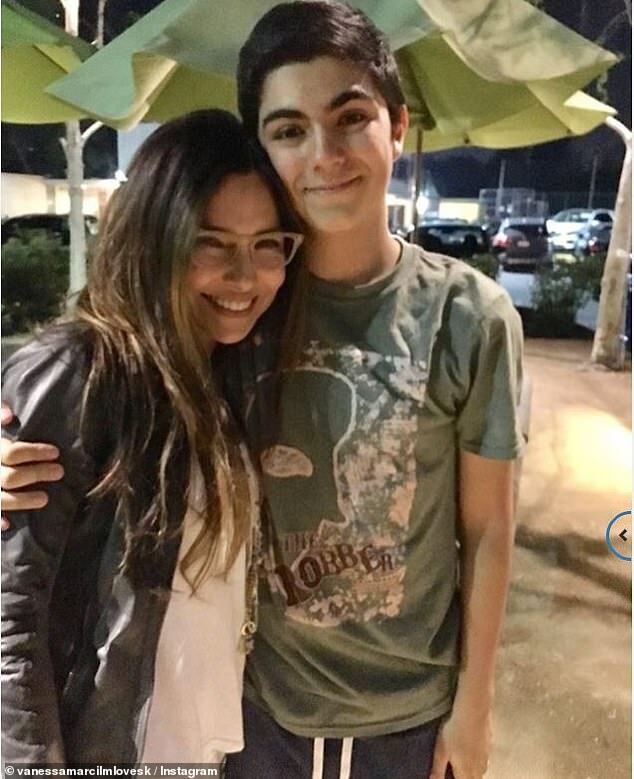 In Los Angeles, Vanessa Marcil runs a charity home known as Patricia House; an organization who helps motherless kids. It is believed that the actress has an estimated net worth of $2 million. Despite being a mother, Vanessa has managed to keep her body physique intact. She is running into old age but looks way younger than her age. She stands at 5 feet 4 inches and weighs 55 kg. Her body measurement of 36-26-37 inches concludes the fact that she sure has an hourglass shape.